This miniature was one step in the process of creating the sculpture. The southeast corner outside the Student Union is being transformed into a new gateway to Oklahoma State University. Steps away from both the Office of Undergraduate Admissions and the OSU Alumni Association, the Welcome Plaza will represent and exemplify some of the university's best qualities: family, inclusiveness and strong work ethic, to name a few. 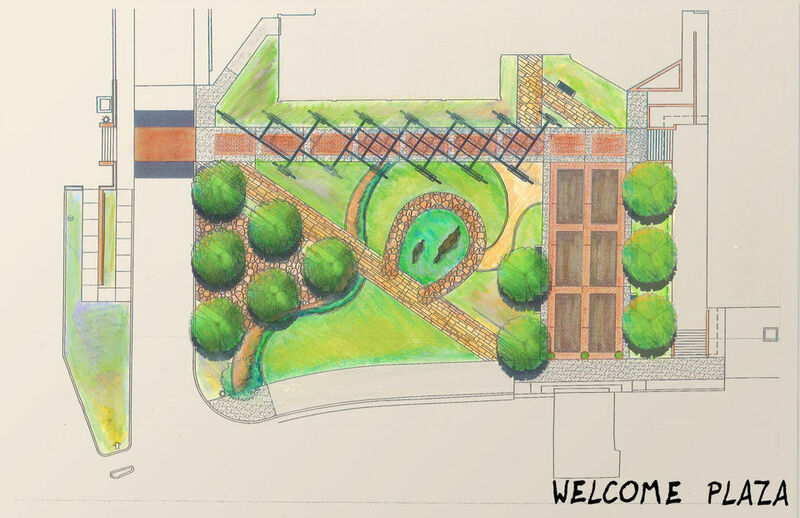 The plaza will be an inviting garden area, landscaped to provide shade and an outdoor living space for everyone on the OSU campus. At its center will be an impressive statue of a galloping mare and her foal, created one-and-a-quarter times larger than reality and cast in bronze. Arbor columns will be inscribed with Cowboy ethics and the alma mater. A bronze sculpture of a saddle sitting atop a fence will also be installed. Planning for the $1.6 million project began several years ago while the sculptures have been progressing for the last two. The university and the OSU Foundation are seeking private donations to offset expenses. Groups, including Women for OSU Council and the Presidents Fellows, have made early commitments. In addition to the plaza at large, donors can help fund benches, columns, sculptures and other features planned for the space. The ground where the plaza will sit was a blank canvas rife with opportunity. "We knew the spot needed something, but we probably had not challenged ourselves on what it could be," says Steve Dobbs, landscapes services manager for facilities and management. The challenge came through a request by Kyle Wray, the university's vice president for enrollment management, who wanted something that would speak to students, alumni and prospective students with western and upscale-rustic influences. "Upscale-rustic tied to OSU's traditional neo-Georgian architecture couldn't be more of a challenge," says Dobbs, who has lead the charge for campus beautification over the past several years. He has overseen the addition of unique features, including the boot and hat topiaries that have become popular campus attractions. "The mare is really intended to represent alumni and staff and faculty while the foal is meant to represent the eager freshmen ready to run out and change the world," says Dobbs, who gives the credit of the concept to OSU Facilities Management Landscape Designer Dave Brown. "They're leaving home, so the mare can also represent parents and alumni keeping a watchful eye while the freshmen go and find their place at OSU." The symbolism was an important element to artist Marrita Black when bringing the horses to life, first in clay and then a series of cast bronze. "Horses have emotions. They are happy and can be sad. They're hungry and they have friends they miss when they go away – both human and horse friends," she says from the Crucible, a notable Oklahoma foundry where the sculptures were being completed over the summer. "I thought about families and students and the anxiety students must have as they're running off to college," Black says. "But you've gotta cut those strings. It's a big part of growing up." Because of its size and weight, the sculpture is cast in hollow pieces and later welded together, treated and mounted. Hollow and lying in pieces on the foundry's floor, it's hard to appreciate the sheer magnitude of the mare. But the details of the piece are exact, the mother's eye looks as though it might blink or move in search of her offspring. At Oklahoma State, across the hall from the Office of Admissions, Wray sits in his office, the sounds of the plaza's construction barely audible on a hot summer day. He says the anxiety of coming to college is something he hopes the plaza addresses. "It can be intimidating coming onto campus. Some people start thinking, 'I'm not sure I fit in here,' or, 'People here are smarter than me. I'm not sure I can afford a degree,'" he says. "This helps start a conversation about how students will find a place here at OSU. What we do here at OSU is make people feel at home and make people feel wanted. They leave here thinking they're special." The horses, the columns and the cowboy code of ethics will help them better understand those intangible qualities that make OSU unique. 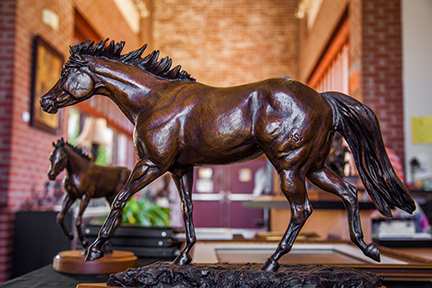 Texas-based artist Marrita Black has spent countless hours perfecting her sculptures during each phase of the bronzing process. 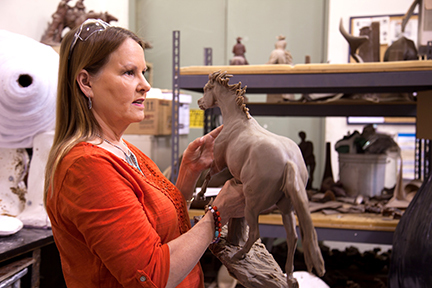 For nearly two years, she has worked diligently to infuse life into clay and bronze, the result of which will forever be a part of the OSU legacy. "The bottom line is we're a family and we look out for own. We're not pretentious about it," says Dobbs. The plaza's location will also help potential students and alumni appreciate and understand the role the OSU Alumni Association plays for students while they are enrolled and throughout their lives. The ConocoPhillips OSU Alumni Center will be framed nicely behind the sculpture of the fence and saddle, creating unique photo opportunities for students, families and alumni alike. "We feel the Welcome Plaza only enhances the idea of the Cowboy family since our building welcomes both prospective students and returning alumni all year round," says Chris Batchelder, president of the Alumni Association. "We want prospective students and families to view the Alumni Association as their connection for life to Oklahoma State. We serve Cowboys of all ages to connect them with each other and OSU." For all the Welcome Plaza symbolizes, it also serves the purpose of creating a functional and positive introduction to campus. "If you're a guest, a prospective student, alumni or a family, the first place you're going to go is the Student Union parking garage," Dobbs says. "Before, we almost pushed them out onto the street because of all the strange sidewalks and lack of access. But now it will be easy to get to where you're going, and we're going to wow you with this landmark plaza. It's going to be a special first impression." He anticipates the plaza's impact will be much like the boot topiary at the corner of University Avenue and Monroe Street. "There's not a day goes by that I don't talk to a student who has commented about the way campus looked and says it's made a difference," he says. "It looks like people have pride in their work here and they take care of it. It emulates that we're going to take care of our students. Parents feel that way, too: if you're going to take care of your campus, you're going to take care of everyone. "You don't realize how people connect to it." Wray calls it "the front porch to OSU." "This is the focal point of our future. It's the gateway to OSU," he says. "Rarely can an alum give a gift like this to a student." Eleven arbor columns will be inscribed with tenants of the Cowboy code of ethics. The entire arbor creates a dramatic backdrop to the sculptures included in the Welcome Plaza and adds to the space's symbolism of what it means to be a part of the Cowboy family. We stand for what matters, even if we stand alone. We know challenges come with pain, but pain will not win. We dream only as big as the sky. We have a passion to do what's right, even when it's hard. Being a Cowboy isn't in our clothes, it's in our character. We end the day knowing we gave it everything we had. To our Alma Mater, O-S-U!